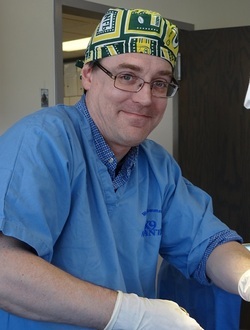 Dr. Duane is an Eau Claire native. He started his journey at Westgate Animal Hospital in July of 2004. He enjoys spending time with his wife, three daughters and son. Duane has 5 cats, 1 dog, 3 horses, 2 lambs, 3 rabbits and about 15 chickens. He enjoys chasing his kids around the house and also enjoys spending time in the barn taking care of his many animals. In his free time Duane enjoys ice skating and having Nerf Gun wars with his kids. Dr. Nate started his veterinary career doing mixed animal practice treating dairy cows, horses, as well as companion animals. Although he enjoyed large animal work, he found working with dogs and cats easier on his body and better for family life. 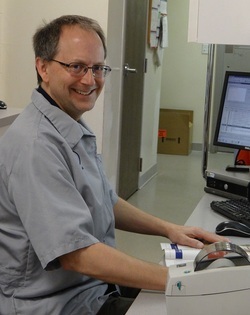 He has been with Westgate since December 2003. Nate enjoys spending time with his wife, Sara, and their two girls, Annika and Britta. On his days off, he can usually be found on a nearby lake fishing with his girls or sitting in a tree stand. As a family, they enjoy camping, biking, and hiking. He has two rambunctious dogs, Belle and Kia, and a backyard with many holes, yellow spots, and the occasional patch of green grass. Dr. Pam especially enjoys spending time at home with her husband, Gary, and their four boys. She is involved with the youth ministry at her church and also enjoys gardening, interior decorating, and reading books. She shares her home with four Labrador retrievers, a shih-tzu, two cats, a leopard gecko, and a bearded dragon. 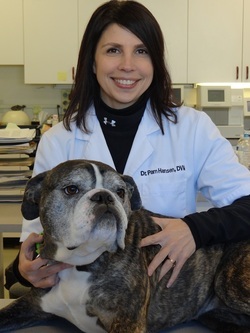 Dr. Pam has been with Westgate Animal Hospital since 1999. Karen is originally from Springfield, IL. She moved to the Wisconsin area after completing her schooling and currently resides in Elk Mound with her husband Logan. They have two kids, Ethel and George. They share their home with a Border Collie named Toby, a cat named Sansa, 3 horses, Lucy, Duke and Lobo, and some chickens. Karen enjoys horseback riding, going on walks with Toby, snowshoeing, running and enjoying the outdoors. Kathy started at Westgate Animal Hospital in May of 2015. She and her husband, Tim, and daughter, Erika moved to Wisconsin to be closer to family. Kathy enjoys spending time outdoors, quilting and learning more about aquaponics. She has 2 active dogs, and English Setter and a Dachshund, and also 3 cats.